Donald Trump said he was casting aside the ?failed strategies of the past? as he upended 70 years of US foreign policy and forged ahead with his controversial decision to recognise Jerusalem as the capital of Israel. The president?s announcement was met with celebrations by Israel and immediate fury from the Palestinians, who accused him of destroying any hope of a peace deal. ?We cannot solve our problems by making the same failed assumptions and repeating the same failed strategies of the past,? Mr Trump said. ?It is time to officially recognise Jerusalem as the capital of Israel.? Defying warnings from around leaders around the world, Mr Trump said he ?judged this course of action to be in the best interest of the US and the pursuit of peace between Israel and the Palestinians?. The Palestinians insist that there can be no peace deal unless they are able to have east Jerusalem as the capital of their own independent state and said Mr Trump?s unilateral move had disqualified the US as peace broker. ?These condemned and unacceptable measures are a deliberate undermining of all efforts exerted to achieve peace and represent a declaration of the United States?s withdrawal from undertaking the role it has played over the past decades in sponsoring the peace process,? said Mahmoud Abbas, the Palestinian president. Hamas, the Islamist militant group which controls the Gaza strip, accused Mr Trump of ?flagrant aggression? and called for Muslims across the Middle East to rise up against US interests. The decision was hailed by Israel and Jerusalem?s mayor ordered the American flag to be beamed in lights against the walls of the Old City in celebration. ?We are not taking a position of any final status issues including the specific boundaries of Israeli sovereignty in Jerusalem or the resolution of contested issues,? Mr Trump said. ?The US would support a two state solution if agreed to by both sides.? He called ?for calm, for moderation, and for the voices of tolerance to prevail?. 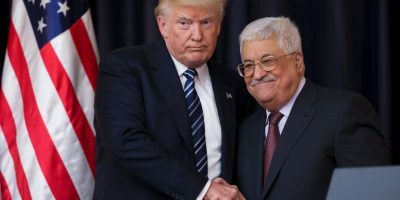 Mr Trump’s speech left little solace for Palestinians as it did not firmly commit to the idea of an independent Palestine, nor make any mention of their major concerns like the construction of Israeli settlements in the occupied West Bank. The status of Jerusalem is one of the most sensitive issues in the Israeli-Palestinian conflict, and Palestinian leaders insist there is no hope for a peace agreement unless they are able to set up their own capital in East Jerusalem. Israel claims the entire city as its “eternal and undivided capital”. Husam Zomlot, the Palestinians’ chief delegate to Washington, said recognising Jerusalem as the capital of Israel was a “stab in the back”. With Mike Pence, the US vice president, standing by his side, Mr Trump reminded American voters that both Bill Clinton and George W Bush had promised to move the US embassy to Jerusalem but had reneged once in office. ?They failed to deliver. Today, I am delivering,? he said. Theresa May said the UK “disagrees” with Mr Trump’s decision. The Pope earlier said he had ?deep concern? about the situation in Jerusalem and urged Mr Trump not to move ahead. ?I make a heartfelt appeal so that all commit themselves to respecting the status quo of the city, in conformity with the pertinent resolutions of the United Nations,? he said. French President Emmanuel Macron said the decision was “regrettable” and called for calm across the region. “This decision is a regrettable decision that France does not approve of and goes against international law and all the resolutions of the UN Security Council,” he told reporters. German Chancellor Angela Merkel said she “does not support” Mr Trump’s position on Jerusalem. ?The German government does not support this position, because the status of Jerusalem is to be resolved in the framework of a two-state solution,? she said. “In this moment of great anxiety, I want to make it clear: There is no alternative to the two-state solution,” Mr Guterres said. Reaction was muted from most of America?s Arab allies, many of whom have either official or covert relationships with Israel. Turkey?s deputy prime minister, Bekir Bozdag, warned that Mr Trump was ?plunging the region and the world into a fire with no end in sight?. Mr Erdogan called for a summit of Muslim leaders next week in Istanbul to discuss the situation. Iran and Egypt’s governments also issued statements rejecting the move. Shortly after Mr Trump’s speech, the Czech Republic became the first country to follow suit and announced it was recognising west Jerusalem as Israel’s capital. It said it also considered Jerusalem to be the “future capital” of Palestine. The streets of Jerusalem?s Old City were quiet as residents sheltered from biting winter rains and there was no sign of the ?Day of Rage? called for Palestinian political factions. The reaction of ordinary Palestinians ranged from anger to apathy. ?This is a symbolic step, because Trump need to achieve a victory,? shrugged Sami Ibrahim, an Old City merchant. ?He has achieved a victory on the weakest people, the Palestinians. ?